I bought Lakme All in 1 Instant Skin Stylist SPF 20 Complexion Care Cream when I went to India last year in November. For those who don’t know CC creams ( CCクリーム )or complexion care creams are an improved version of BB creams. BB creams don’t work for all skin tones and are not available in many shades. 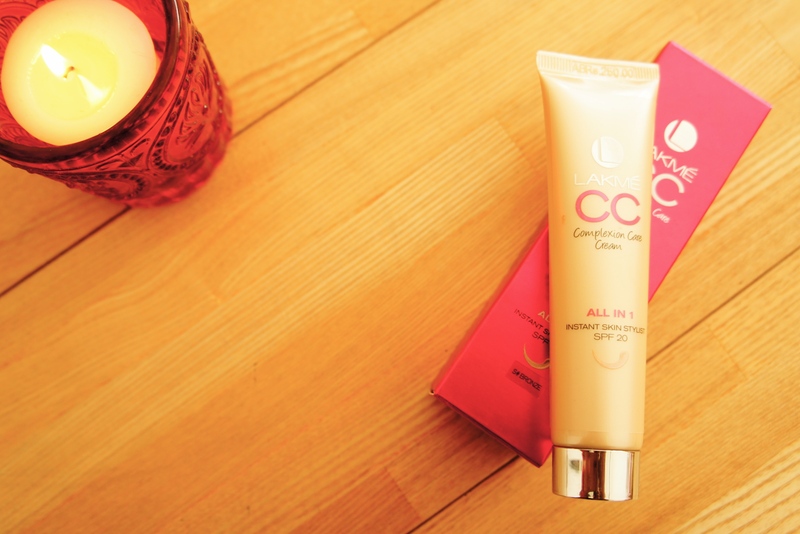 They don’t provide enough coverage…so here enters a cc cream. These creams give a radiant look and they contain collagen to give skin a smooth and plump appearance. They are lighter and less oilier. They brighten dull skin by diffusing pigment particles and have superior skin care benefits like spot treatment, improving skin tone, skin texture etc. They contain botanical ingredients that improve and repair the skin. Lakme CC cream is not exactly a cc cream as it doesn’t have all the ingredients and benefits of a CC cream, but still, it is a good product. It instantly protects, evens skin tone, conceals and freshens. It comes in two shades – Beige and Bronze. Bronze is yellower than Beige. I got the Bronze one in a 30 ml pack for 4 $. The packaging is adorable with a convenient light golden tube with silver cap and pink details whereas the box is totally pink with golden letters. It contains glycerin that moisturises the skin and doesn’t dry it. It contains SPF 20. It has a nice lemongrass scent which disappears after some time. It is a light formula, has a very smooth velvety texture and gets easily absorbed into the skin. It blends easily with the fingers. It conceals almost 80 % of my marks and spots. Rest I can easily hide with a concealer. I love the natural look I can get with this cc cream. Perfect for office and day time wear. It doesn’t feel heavy on the skin and if you don’t over do it, no one can find out if you are wearing makeup!! It is so hassle free..I reach for it every morning when I need to leave my house at 7.30 a.m. It is faster to apply it than a foundation. For me it is a refreshing change from wearing foundation ( I need to wear foundation as I have a lot of marks on my face ). It stays on for all day. My T-zone gets oilier after some time but I can take care of it with some pressed powder. 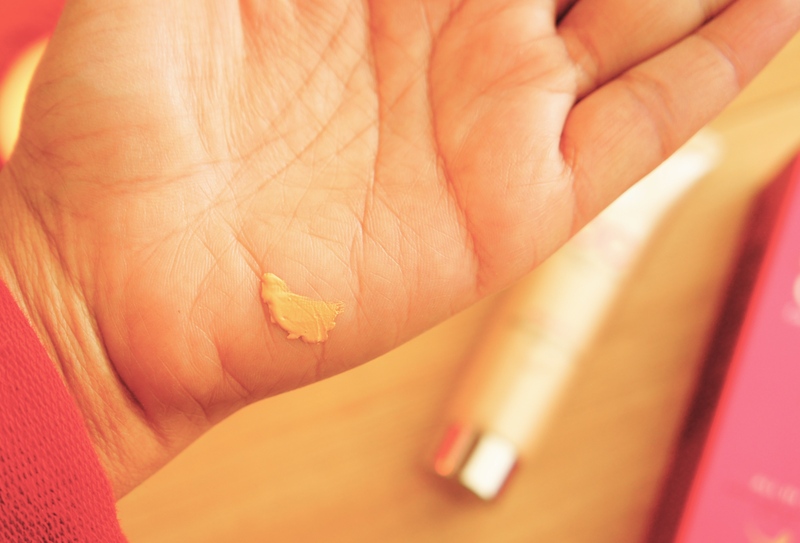 Although its a great product but I have noticed that if I take excess product it sometimes end up looking cakey…so now I take a little product first and then I gradually build up if I need more coverage. Also sometimes it gets stuck in my dry patches, so now I ensure that my face is well moisturised before I apply it. But if your face doesn’t have any dry patches this cream is well hydrating just on its own. Overall it is an awesome product. Do try it.. I am sure you will love it!! Watch this video if you want to know what else I got from India! !